Here are my humble impressions of the Kekkaishi anime. As you may or may not have seen in an earlier post, I finished watching the series last night and figured I would have a go at writing up a little essay on it. So here it is. The story of Kekkaishi revolves around two families, the Sumimuras and Yukimuras, who have been tasked with protecting the land of Karasumori. This filial tradition began centuries ago when a powerful Kekkaishi named Tokimori Hazama first took up the mantle of defender of Karasumori. Now that duty has been passed on to Tokine Yukimura and Yoshimori Sumimura. Karasumori is a source of great power yet at the same time this power attracts evil spirits or ayakashi. A singular group of ayakashi called the Kokuboro are seeking to conquer Karasumori so that they can use its energy to rejuvenate their leader, the Nine-tailed Fox Princess. Along the way, Tokine and Yoshimori are joined by the half-ayakashi Gen Shishio and the mysterious Yagyou or Night Troop who also have a stake in the fate of Karasumori. At it's heart, Kekkaishi is a shonen action anime with supernatural elements. The show was aimed at a younger audience but this in no way diminishes it's quality. If anything, it only makes Kekkaishi more enjoyable for everyone. There isn't even the faintest suggestion of fan-service nor does it ever become crass with it's humor. Without these distractions Kekkaishi is able to focus on its strengths, that is, the story and the characters in it. 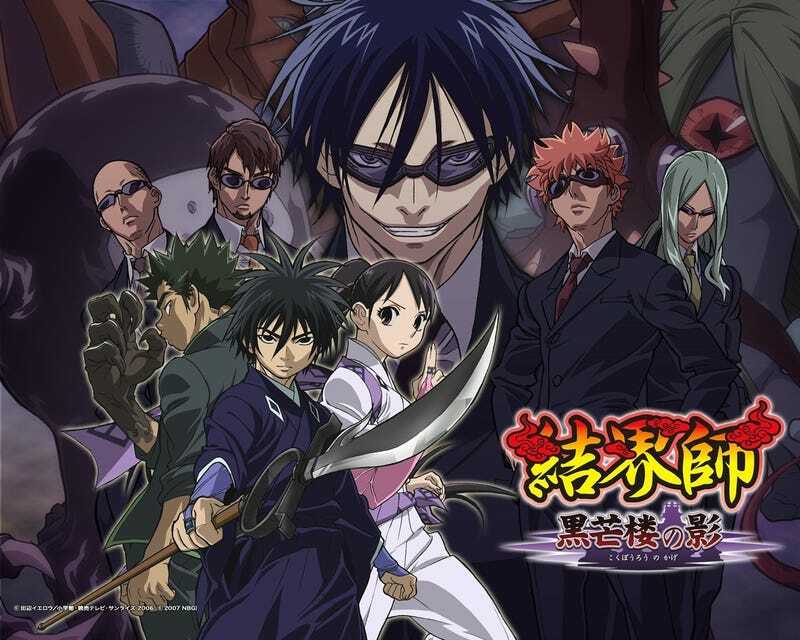 Being a shonen type anime, it is expected that Kekkaishi should have plenty of gripping battles and fierce combatants for the heroes to face off against. Kekkaishi more than meets this expectation. The ayakashi are unique in that they cannot be defeated by sheer force of violence. Instead, Tokine and Yoshimori must rely on their Kekkai techniques to bind and dispel the various supernatural creatures. Combat is further complicated by the fact that the longer an ayakashi stays in Karasumori, the more power it absorbs. This type of set up means that most battles involve a lot of strategy. Unlike some other shonen anime, the fighting in Kekkaishi never feels drawn out, people don't spend entire episodes charging up for their ultimate attack or even worse, monologuing about how they're going to do that. Battles are quick yet action packed. What most impressed me about Kekkaishi was it's cast of characters. Tokine and Yoshimori were the main protagonists but also several minor characters are given adequate screen time. As far as protagonists go, Yoshimori is likable and charismatic without being annoying. He has his quirks, sleeping too much and an enthusiasm for baking cakes, of all things! Also, he is a bit stubborn as are most of these types of heroes. Yoshimori's counterpart Tokine is, completely average. Average in a good way though. In a way Tokine is the quintessential high school girl with magical powers. Words such as strong willed, determined, independent and compassionate all best describe her personality. One thing that does set Tokine apart and above other female characters in anime is that not once does she rely on her physical appearance. There is a romantic aspect to Kekkaishi. The relationship between Tokine and Yoshimori is handled in really mature and thoughtful way. It is more subtle than most romances, they never spell out their feelings directly but there is an understanding between the two that renders such actions unnecessary. Gen is portrayed as the typical lone wolf but he is much more fascinating. Aside from being a total badass, Gen struggles to make friends and come to terms with his past and his human/ayakashi nature. I won't spoil anything, I'll just say that of all the characters Gen really does evolve the most. As mentioned above, several minor characters are allotted time to develop. These include members of the two households as well as their friends. Even most of the principle antagonists are given sufficiently detailed back-stories. This being said, there are a few episodes that only serve as filler but they manage to be entertaining in their own way. On a technical level, the animation in Kekkaishi is consistently good. I'm no expert on animation styles but I will just say that I happen to like the look of Kekkaishi. One last thing. The opening theme is amazing. The song "Sha la la Ayakashi Night" by Uura Saeka is all around rockin'. It's one of those songs you hear and know that you are in for a wild ride. Here it is. engaging, humorous and fun the whole way through. The characters exhibit verisimilitude and the premise is intriguing yet not at all convoluted. From one otaku(I only jest!) to another, Kekkaishi is a must watch.